Bollito Misto literally translates from Italian to “Mixed Boil” and doesn’t sound like the sexiest way to cook vegetables. In Italy, mammas make bollito misto by boiling various meats together for hours (tongue, capon, veal, etc.) then serving the meats with tasty sauces and serving the broth with tortellini. Deborah Madison had a veggie version of bollito misto in Vegetarian Suppers that I wanted to try and it was fantastic. Easy to make and super satisfying on a chilly, rainy night. Take 2 large sautee pans (I used a 10-inch and a 12-inch) and fill 2/3 with water. Divide ingredients among the saucepans and bring to a simmer. Use one of the pans for stinky or difficult vegetables (turnips, radishes, brussels sprouts) and the other for more neutral vegetables. Slip the veggies that take the longest to cook in the water first (potatoes, carrots, celery) and then continue to add in the other veggies as you move along. Basically I added in the veggies as I prepped them. Keep checking the veggies and gently stir them. If you’re afraid that anything’s getting overcooked, it’s easy to take it out of the broth. Continue to simmer until everything is cooked through. It won’t take long. 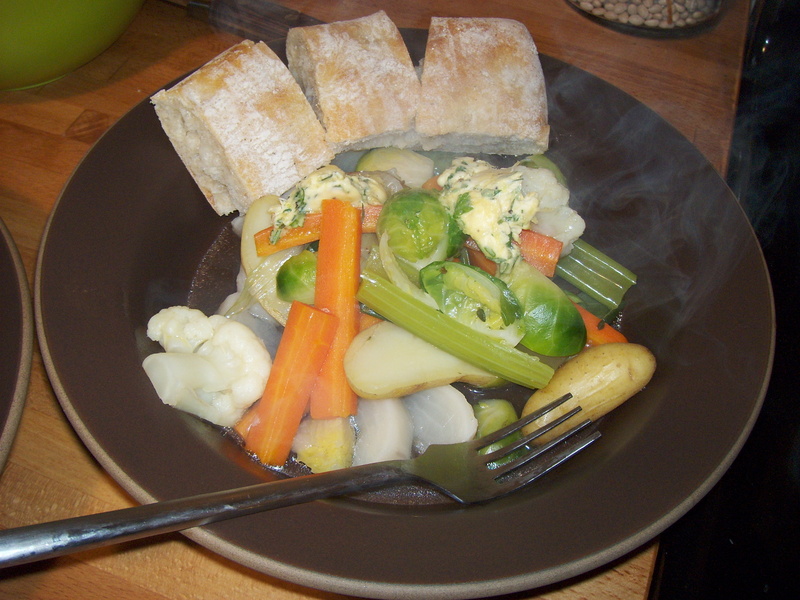 To serve: With a slotted spoon pile the vegetables in a dish and pour a little bit of the broth on top. Dot with the mustard butter, which will begin to melt into the sauce and serve with some good bread.